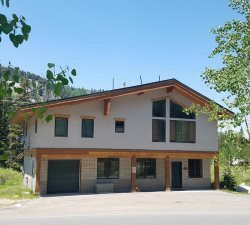 Pine Meadows, one of many cabins for rent in Utah by Mount Majestic Properties, is perfect for a family ski vacation getaway. This two-story cabin is nestled on an acre of pines and aspens. There are two large decks that are perfect for sunning or watching skiers. There is a gas grill located on the larger deck. Sleds are provided as well. Wood is provided for a large wood burning stove in the living room. Fantastic place for a ski-vacation. The setting is gorgeous. The place was perfect. Slept 6 comfortably with a very large living area. To top it off the place was also walking distance to Brighton. I would highly recommend renting this place.